Notes: Works with EFI and carbureted engines.. Starter bolts and shims are included. 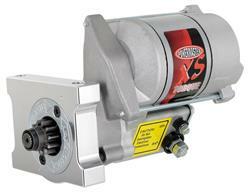 With their gear-reduction drives, heavy-duty Powermaster PowerMax starters really crank out the power--160 ft.-lbs. of torque. So, they can handle engines with moderate compression ratios. If your stock starter clears your oil pan, the Powermaster PowerMax starters will, too. Some will also clear kicked-out pans. Powermaster PowerMax starters can be mounted in multiple orientations, featuring the new infini-clock mounting system. Starter dyno reports and mounting bolts are included. So far so good. Only been installed a couple of weeks but the apparent craftsmanship was a relief to see out of the box and it came with new mounting bolts as well. If you feel that this review is inappropriate and should be removed from the site, report it to us by clicking the "Report Abuse" button below. The starterc was stalled on my 2000 Camaro SS with LS1 .. started right up .. Then we went to my tuner five hours away ... Starter failed on a Sunday 357 miles from home .. Had to buy a new Solenoid .. Would not and will not buy again ..